I’m sure you have had a version of this popular dip at one time or another. It is another one of my family’s favorite dips. We seem to like a lot of dips…hmmm…I wonder what that means? I think it means we like a good party! I decided to make this dip over the Labor Day Holiday because I hadn’t made it all summer, which, thinking back, is hard to believe. I don’t know where the name of this came from. 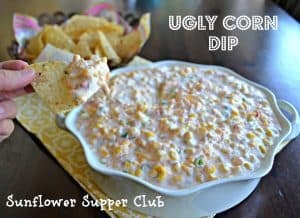 We have always called it Ugly Dip, but I have also heard it referred to as Crack Corn Dip. It is most addictive and thus perfect for a tailgate or for just about anything you might need a dip for. I often use “light” cream cheese, sour cream, and mayo with great results. If possible, do let it sit a few hours for the flavors to blend — it really makes a difference. Want to take it over the top? Cook and crumble some bacon and sprinkle it over the top before serving. In a medium bowl, combine the cream cheese, mayo, and sour cream. Stir in the corn, rotel, green onions, cheese, sugar, and garlic powder. Best if you can refrigerate it for a few hours before serving to allow the flavors to blend. WOW that looks yummy! Thanks much for sharing…we really really love easy dips too. MMM good! Love me a cheesy corn dip! I have never had corn dip before, but think I will try this. I love the name! I would love to call something ugly that tastes really good! Thanks for linking up with us this week at Foodie Friends Friday. HELP! Made this last night to take to a party today Sunday December 13th – party postponed until Thursday December 17th . Will Ugly Dip keep & still be good ? Can this be frozen? Hello, Diane. I have never frozen this and I don’t think I would recommend it. I have made this several times and we have eaten on it for 3 or 4 days. If you’re a type A like me you might plan a backup dip just in case, but I think you will be okay. I would love it if you came back and let me know how it worked out. Thank you – really didn’t think freezing was an option. I’m convincing myself that it should be ok even after 5 days? – mayo & sour cream only thing iffy & imagine I’ve eaten things that old before that have contained one or both. I’m hooked (although don’t think we can eat entire recipe ourselves). I’ll let you know the end result. Agree – wondering if green onions will keep getting stronger and/or too slimy/mushy. I have sampled dip again recently & even now thought green onions a bit stronger so your latest comment makes a lot of sense! This is my new go-to recipe for parties! I love it so much! In fact, I’m making it tonight to go with cheeseburgers just for fun! It is one of our favorites as well! I am making it tomorrow night for a “dip” dinner we have when watching the basketball games. Thanks so much for visiting Miranda.